You’d be pretty happy too if you were dating Carrie Underwood. 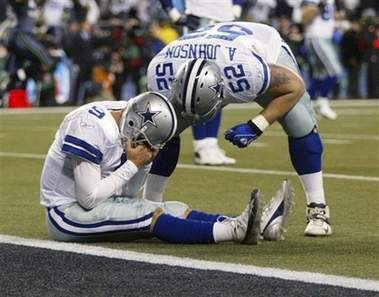 Enter Tony Romo, the man who supposedly saved the Cowboys last season after finally putting down the troubled career of Drew Bledsoe only to have it all come crashing down on himself in a meltdown for the ages. While showing flashes of brilliance when Bill Parcells made him the starting quarterback last season (which included a huge upset of the juggernaut that was the undefeated Colts), he faltered towards the end of the season and capped it off with a photo opportunity that looked like a Smiths album cover. Before this season started, doubts remained whether he was the man for the job in Dallas. His talent and abilities were undeniable, but it was his performance in the big games and consistency that remained questionable. With only one more year remaining on his contract, this was the season he had to convince Jerry Jones that he was their man. And this past Sunday night, he convinced all of us. Playing on the biggest stage at home in Texas Stadium on opening night against their rival New York Giants, Romo one-upped Peyton Manning’s incredible performance that kicked off the season. Throwing 4 TDs and running in one himself, he was on the winning end of an offensive shootout between himself and a surprisingly effective Eli Manning. Sure, it was against one of the worst secondaries of 2006, but 45 points is nothing to scoff at and Romo showed poise and leadership that night. He held his composure when a Giants comeback was only a defensive failure (by another one of the worst secondaries in the league) away. More importantly, he made the Cowboys a threat again in the NFC East where the Eagles dominated the past 5 out of 6 seasons. As a bona fide Cowboys hater, this rattles me to the core. Not only that, but Romo’s brilliance included two 20+ yd. touchdown passes to Terrell Owens which capped off a dominating performance by Dave Rawkblog’s fantasy football team. (Editor’s note: Go Tony, go!) Clearly, my fantasy football league is operating outside of the rules of this dimension when Dave is somehow winning. But I digress. Romo looked great on Sunday night. And under the new leadership of defensive guru Wade Phillips, that defense could be fixed. As early as it is in the season and as much as I’d hate to say it, I don’t think I’m going out on a limb to say that the Cowboys are back. Something is happening in Big D and it frightens me. It frightens me a lot. The Sporting Life with Carman Tse: Real talk. Click below for more.